So I didn’t get to write my birthday post after haul, I was too busy packing as me, my mom and my little sis are off to the seaside for the weekend, another birthday treat, aren’t I a lucky girl. Me and my little sis especially have really bonded over the last two years and these past few months have been difficult for me and my family so this is a perfect opportunity to get away and have some girly time together. As you can see it’s quite a collection, which has actually occurred in my quest to find jewellery to go with my birthday outfit (post to follow soon!). 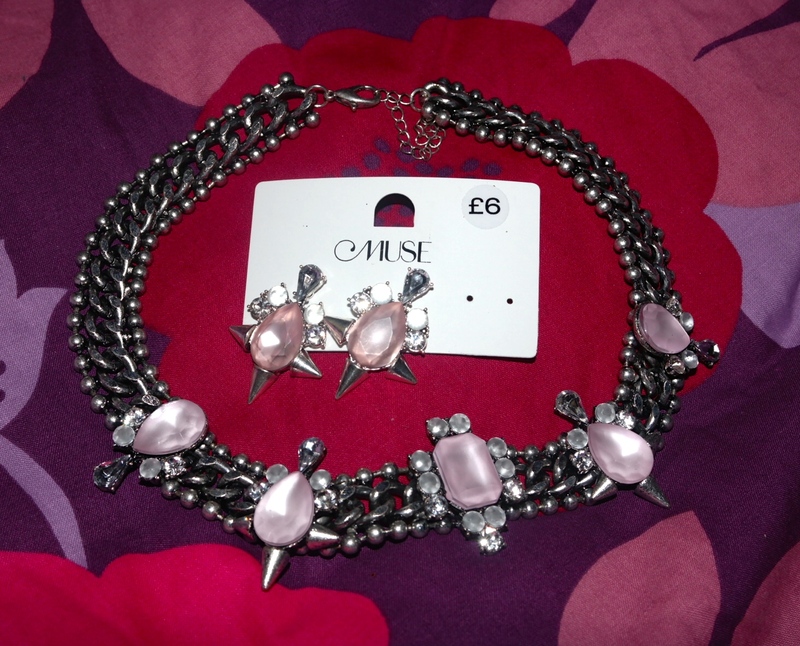 First up is this lovely statement necklace with matching earrings. This was from a little store in Coventry centre whilst out with my bestie and the items were 3 for 2 (other purchases coming right up!). The necklace is quite heavy but sits really well on the neck. The necklace itself is like a dark grey colour with lovely pink jewels with some clear stones in there to, and the earrings are exactly the same, nice big pink stones with some smaller clear ones. I think I already have my occasion picked out to wear these beauties. 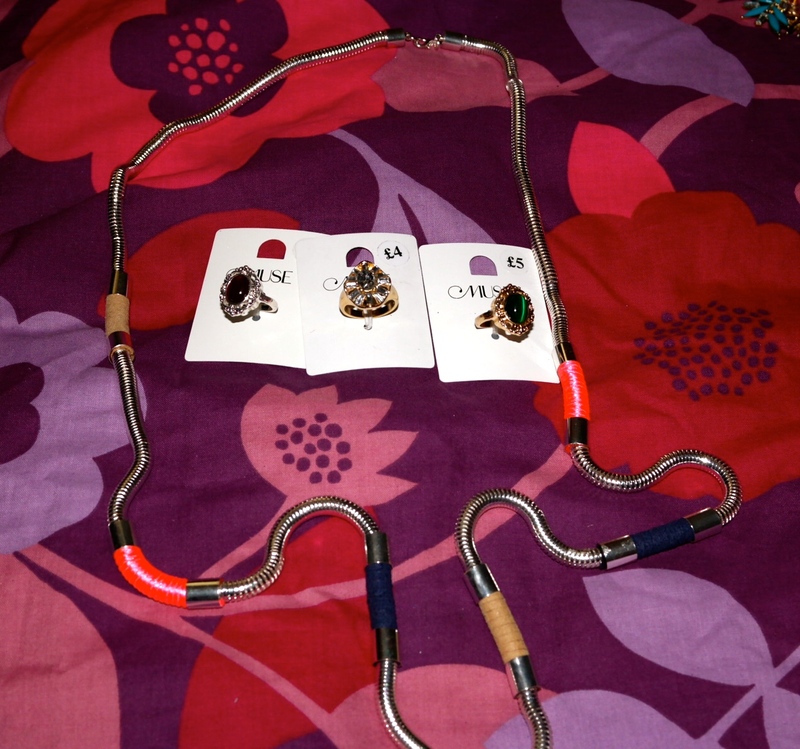 Next up, from the same store are these 3 rings and long colourful necklace. Lets talk about the necklace first. It is quite long in length, but will go perfectly with a plain t-shirt or a plain maxi dress with its pink, blue and beige/gold coloured ribbon and leather detailing. 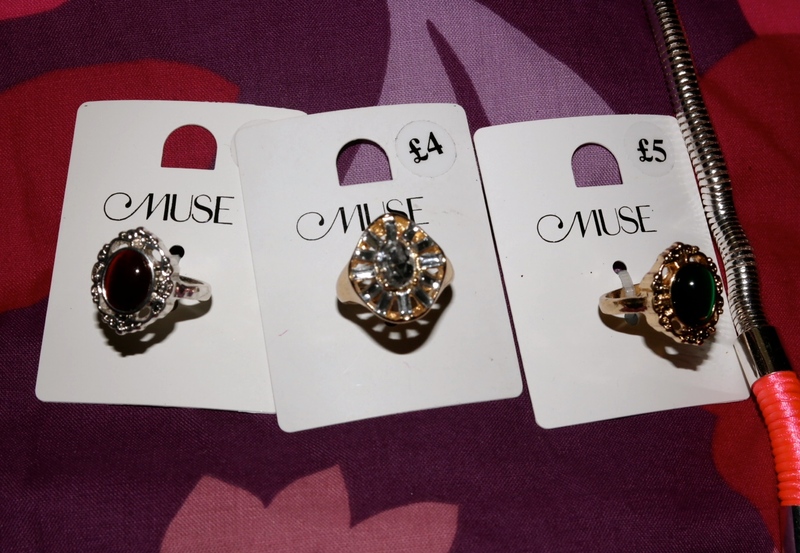 The two outside rings are quite celtic in design, one is silver with a red stone and the other is gold with a green stone – all three rings were at the counter when I went to pay and I quickly picked them up for my collection. The middle ring is gold with clear crystal stones in, they are all quite simple but very pretty. 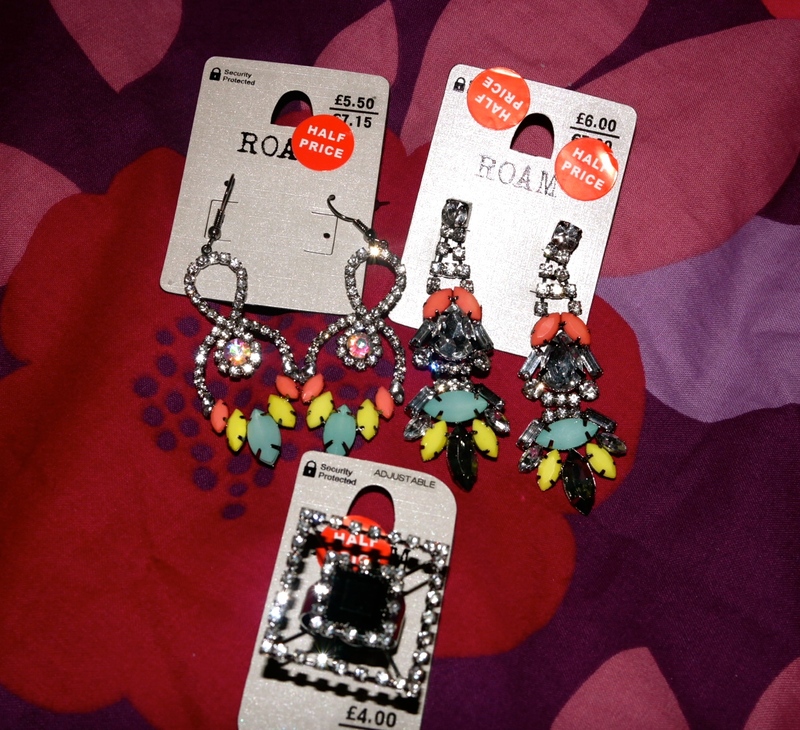 I stopped at New Look, as I wanted to check out their statement necklaces but somehow got side tracked and found myself purchasing some sale items instead! 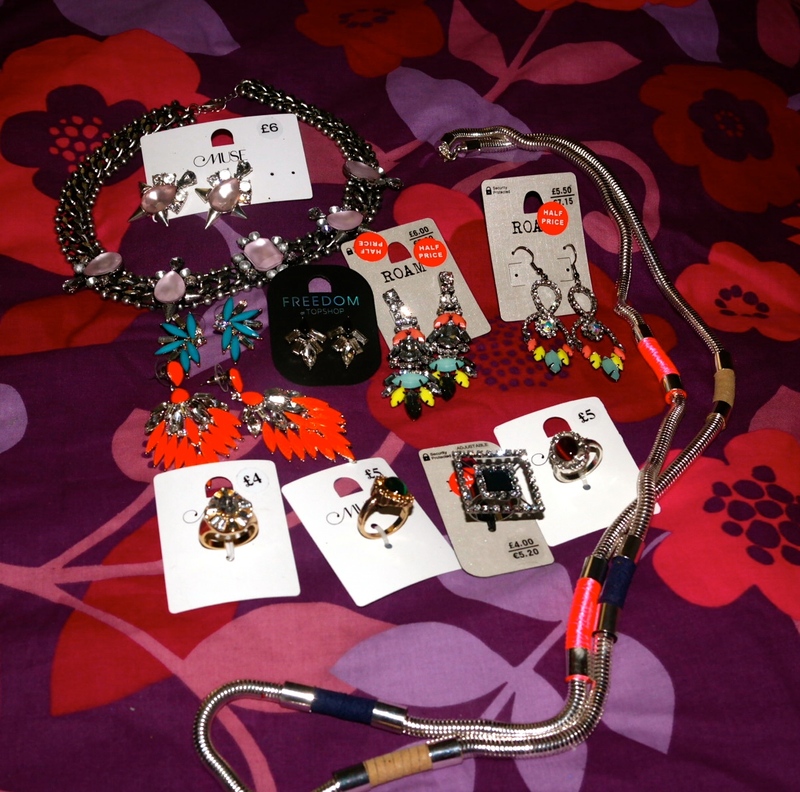 Two pairs of earrings and ring to be precise. The two sets of earrings are pretty similar in colours but are different styles, very summery in their colours and perfect for my holiday! The ring is square with a black stone in the centre surrounded by clear stones. I thought this was different being square and it is very sparkly – I am such a magpie. 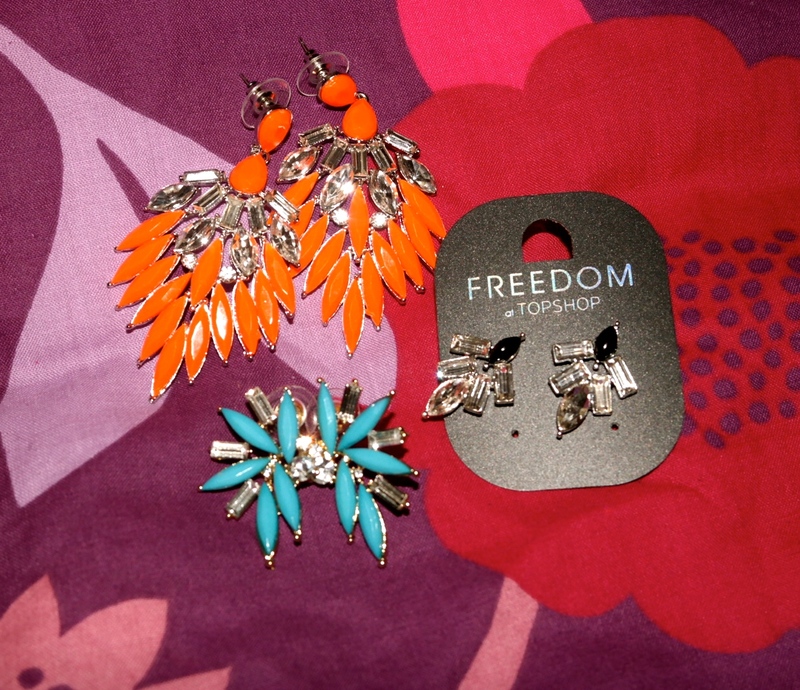 Two of the final three, the orange and the blue, were from a little shop called Aspire Style in Solihull, with the final pair being from Topshop. I just loved the colours of the orange and blue, and the style would’ve been perfect for my birthday outfit had they done them in black or white or even clear stones, but hey you can’t go wrong with a bright orange pair, right? The blue ones are a bit more subtle, but in no way are they any less of a statement! The topshop earrings are black and clear, and will be perfect for my outfit, they are a bit smaller than I originally wanted, but they have turned out to be quite perfect. I am almost there with the coming together of my birthday outfit, just hair, nails and makeup to be done! What are your jewellery weakness?